On Saturday, Texas Gov. 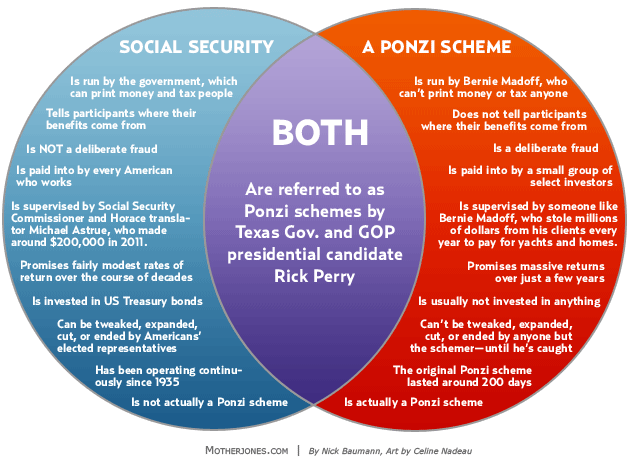 Rick Perry told a group of voters that Social Security is a “Ponzi scheme” and a “monstrous lie” to younger Americans. It’s not the first time the GOP presidential candidate has made such claims. The Texas governor also described Social Security as a Ponzi scheme in his 2010 book, “Fed Up!,” and has argued the program is unconstitutional and could be handed over to the states. Very simple: anyone who says that Social Security is a Ponzi scheme either misunderstands Social Security, misunderstands Ponzi schemes, is deliberately lying, or some combination of those…After all, a Ponzi scheme is a deliberate fraud. Saying that Social Security is financed like a Ponzi scheme is factually wrong, but saying that Social Security is a Ponzi scheme or is like a Ponzi scheme is basically a false accusation of fraud against the US government and the politicians who have supported Social Security over the years.